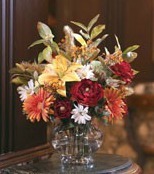 Your plans are shaping up nicely and now you are looking for ideas on flower arrangements. Sit back, relax and enjoy. Let’s decide what kind of statement you want to make? Do you want your arrangement be glamorous, romantic, classic, or budget conscious? 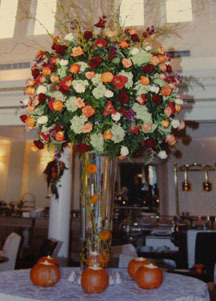 Will you hire a florist to make your arrangements or will you create your own floral pieces? If you enjoy the limelight and glamor is your goal - use vibrant colors blending rhinestones, pearls, and crystals. Tiered or towering centerpieces using roses, orchids, calla lilies and tulips make a lavish statement. You have always dreamed of your prince charming sweeping you off your feet and living happily ever after. 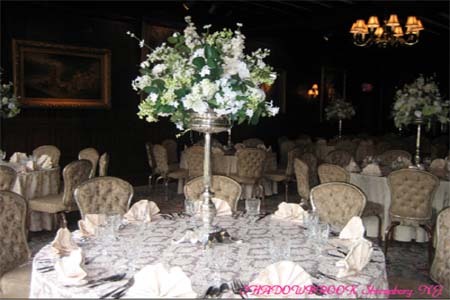 Your magical reception is being held in a garden, castle or old mansion and now you are selecting your flower arrangements. Pastel color flowers - roses, peonies, and tulips mixed with baby’s breath assembled in a fine crystal or gold vase placed on a lace doily creates an enchanting floral centerpiece. Simple elegance and tradition are what makes you feel at home and comfortable. Your reception will most likely take place in a fine catering hall, country club or at a friend’s home with a beautiful backyard. You are looking for a simple, elegant and sophisticated floral arrangement that has soft colors and unusual shapes. Hydrangeas, gardenias or lilacs surrounded by ivy have a definite classical look. If fresh flowers are too pricey for your budget, take a trip to the dollar store or any craft store and purchase silk flowers to create any of the above designs. Your silk flower arrangement can be put together months before your wedding and you will not have to be concerned with them wilting. Consider one of these silk flower arrangements. This simple arrangement is lovely and has just the right amount of yellows, oranges, blues and greens to offer a classic touch without being overstated. Another budget conscious idea is to use flowers that are in season or cut from a friend’s garden. Place the flowers and greenery in a glass bowl or vase filled with pebbles on top of a mirror doily. The mirror gives the impression of a larger more elaborate centerpiece. If you're getting married in the fall consider using wheat stalks as your filler along with sunflowers cut from your garden. Another inexpensive idea is to carve out a pumpkin and fill it with wild flowers. You can purchase a "horn of plenty" and fill it with gourds and Indian corn. I've seen brides mix and match flowers that they cut from their or a friend's garden. Doing so makes for very interesting arrangements and conversation pieces. 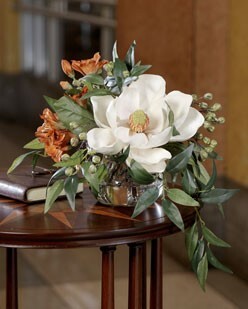 Your choices for wedding flower arrangement ideas are endless. Use your imagination and create an arrangement that suites your taste and budget. It's never too late to get great ideas, start here!